I know many of you have been gripping the edges of your seats in suspense, white-knuckled, wondering what has become of my quest to avoid meat! Well, I’ve taken your suggestions and browsed lots of excellent vegetarian cookbooks: World Vegetarian by Madhur Jaffrey, Vegetarian Cooking for Everyone by Deborah Madison, How to Cook Everything Vegetarian by Mark Bittman. 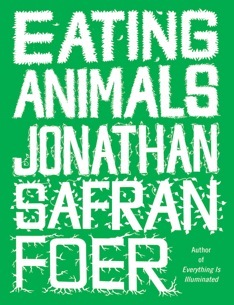 I’ve also gone against your explicit advice not to read Eating Animals by Jonathan Safran Foer. I wasn’t sure what to expect when I picked up Eating Animals. I’d really enjoyed Everything is Illuminated after hearing Foer read from it at a tiny bookstore in St. Paul in 2003. I associate his writing style with lush, almost giddy romanticism, and thought, “well, that plus vegetarianism, sounds warm and fuzzy.” Readers: Eating Animals is not warm and fuzzy. What it is is two things mostly: a philosophical exercise, and an exposé on factory farming. I really loved it, and recommend it to anyone who’s morbidly curious about the gruesome underbelly of industrial-scale farming. Foer really crystallized my desire to stop eating meat, and freaked me out about eggs and dairy while he was at it! But I’m not here to proselytize, so I just want to briefly critique two aspects of the book as a whole — one thing that I didn’t like very much, and another that I absolutely loved. One of Foer’s main arguments is that, although he’s not super excited about animal slaughter, this is small potatoes when compared to the suffering that animals endure while actually living on factory farms. It makes sense if you stop to think about it for two seconds — the industrial farming system exists to maximize profit rather than to look out for animal welfare. But Foer’s tone is fairly preachy, condemning any advocate of humane meat who would dare to even glance at a factory farmed chicken nugget — he basically calls author Michael Pollan a hypocrite. My beef with this is that it’s nearly impossible to live cruelty-free unless you’re completely self-sufficient — and who is?? I’m certain that, at some point while writing his book, Foer wore clothes that were manufactured with cruelty. And somebody else suffered to fuel his airplane. And what about the carbon footprint of the printing, promotion, and distribution of his book? Look: these are the kinds of questions that will drive you crazy; we’re all just doing the best we can. With that out of the way… my absolute favorite thing about Eating Animals is its structure! The book is presented as a series of interviews, with much of the original language left intact — Foer talks to slaughterhouse workers, PETA activists, agriculture execs, and even one vegetarian rancher (! ), all of whom have different viewpoints but make excellent arguments. It’s interesting to read their different tones; for instance, the PETA activist uses shock rhetoric and is way more bombastic than the other interviewees, invoking serial killers and slavery to make his points! Cue the flashing librarian light bulb in my head… as critical readers, when we see this type of rhetoric, we should be trying to gauge the agenda behind the information being presented. Who is presenting the information, and why? What interests are at stake? Is there another side to the story? There’s no foolproof way to calculate the information’s legitimacy, no matter what some information professionals might say — even “peer-reviewed” isn’t necessarily a gold-seal of approval. Maybe the PETA activist is right, but that doesn’t mean you can just take his argument at face value. It’s important not to be a passive reader, and to actually think about this stuff. I did find Foer’s conclusions persuasive, though, nonetheless for being backed by sound facts, a thick bibliography, and an articulate voice. Yet Michael Pollan, who writes about similar subjects while reaching different conclusions, is also persuasive. And so I started a mental thought-experiment: “What if so-and-so had written this book?” I could picture Thomas Friedman convincing me that if the U.S. didn’t factory farm, India would pick up the slack, leaving the U.S. to be devoured by a pack of wild hyenas. Yep, I’d be totally convinced! For me, this just highlights the need to seek out as many perspectives as possible in an effort to think about information from multiple angles. This is transliteracy; this is what I really admired about Foer’s approach. Anyway, I love getting your comments, so please feel free to drop me a note and let me know what you think about eating animals, cruelty-free living, critical transliteracy, you name it. Or just tell a girl where she can get a humane egg hook-up! I get humane eggs and milk from a co-op in town that sells local products. SLC is actually really great about local, organic and humane foods. You can find info about the farms producing each product so you know how the animals were raised and how they’re treated. You can even go visit the farm if you want! I’ll admit that I don’t always get my milk & eggs & cheese from here, because it is expensive, but I wonder if there’s a similar store in KS? What I didn’t like about Foer’s book is that it was so 101-level. That’s fine if that’s what someone is looking for, but compared to some of the other books on vegetarianism, it felt very basic. But if it educates more people on the politics of eating meat, then I suppose that’s a good thing. We have a pretty good co-op here in Lawrence; that’s a great idea to see if they offer local eggs from a smaller-scale farm. I would love to be able to visit my eggs’ farm! I agree that Eating Animals is a little basic, but I think that made it perfect for me : ) As a newbie, there was something really relatable about being on that journey with JSF. And I love that he’s leveraging his fame to raise awareness about farming practices. I can definitely see how it would not be the right book for someone who’s already well aware of the issues, though. One reader recommended the book Animal Factories by Singer and Mason, and I’m curious whether that title would be a good next step? I haven’t read Animal Factories, but I liked The Sexual Politics of Meat, which I think Amanda suggested during the first vegetarian post. I’m with her about my squeamishness reading about factory farming. I admit I shy away from reading about it because I already think it’s bad so I spare myself the images in my head. That’s why I like looking at other sides of the issue like in Sexual Politics of Meat. A different take on things is the movie Temple Grandin, about the woman who changed the way (some) large beef ranches are designed to make the experience less stressful for the animals. It’s still in favor of killing animals for food, but an interesting look at how and why she made the changes she did. It’s more of a biopic of Grandin, but I was fascinated in all the details of the ranches she thought about. I have been avoiding this book since the day I picked it up in Barnes & Noble and leafed through it a bit. I know my tolerances, and I am more than sure that I would be traumatized by quite a few segments of this book, which is unfortunate as I’m sure I would get more out of this book than most of my carnivorous peers. This poor book has been languishing in my “to read” queue on goodreads.com for years now. That being said, I am quite surprised at how inclined I am to give it the old college try after reading your review. I’m not sure if this is dangerous or just a positive sign of my ability to cope with the reality that is the food industry, but it is definitely strange. Whether I eventually bend to my voracious appetite for all things foodie, I am sure that your powers of persuasion need to be carefully wielded, madam. Also, a shout out for an amazing farm I found through Vosges chocolates: Animal Farm in Orwell, Vermont. The name alone makes me giddy, but they introduce their cows by name on the website. The idea of knowing the name of the cow my dairy products come from makes me all warm and fuzzy inside. 😀 They don’t ship their butter during the summer (for obvious reasons) and I have no idea how expensive they are, but we should consider a splurge at some point when you’ll be in town and we can make every pastry and butter-filled dish under the sun! Animal Farm in Orwell!!!! I love it. Book nerds + vegetarian nerds, wow. I love Deborah Madison’s book. good reading and good eating. I’m totally addicted to her zucchini fritters! Ok, I have a confession to make. Someone gave me Eating Animals when if first came out (Well, they gifted it to me on my Kindle) and I started reading it, didn’t like it, never finished. But since I’m trying to recommit to vegetarianism after lapses over the holidays (turkey will always be my greatest weakness), your post made me think I should give it another go, and this time I am really LOVING it. Sometimes you just have to read something at the right moment, I think. So thank you for writing about this book so I could find my way back to it! Also, the eggs I bought today at the co-op said on the label: “laid at will by hens galavanting around the farm.” YES!